This question is embedded in a little-known story in Luke 9:51–56. (I don’t remember hearing it in my years of attending Sunday school.) Jesus and his entourage were on their way to Jerusalem. They came upon a nondescript Samaritan village. It was late and they needed a place to spend the night. Some disciples enquired of the villagers if they could be offered overnight hospitality, normally provided to travellers. However, these Samaritans decided that they would not oblige. They refused to give this Jewish band, headed for Jerusalem, the requested hospitality. That’s when our beloved apostles James and John exploded. They could not stomach a perceived insult by the Samaritans. How dare these pesky Samaritans refuse to offer us hospitality when we are travelling to Jerusalem? Let’s show them their place and prove our superiority! (Or, as is said in Hindi, ‘we will show them their aukat’) After all, we have God on our side. The “sons of thunder” were ready to render justice for the insult meted to their group. (And, most probably, the other disciples would have agreed.) They burst out with this astonishing question: “Lord, do you want us to call fire down from heaven to destroy them?” What a revealing question! At least three things should strike us. First, they possessed great, unmatched faith! They sincerely believed that if Jesus would give them the go-ahead, they could give the command, Elijah-style, and fire would surely fall and incinerate these good-for-nothing Samaritans. That would serve them right for messing with God and God’s people. They thought nothing of destroying men, women, innocent children and hapless cattle! Talk about a pre-emptive strike on an imaginary enemy who is not even threatening you! Second, they imagine that Jesus wants to do what they want to (“do you want …”). God’s people can easily make this mistake of thinking that what they think and feel passionately about must necessarily be in line with what God thinks. There are inherent evil attitudes that good followers of Jesus could still hold on to. Our times, the social class we belong to—and not to miss, the so-called caste we are born into—our cultural and political upbringing, and even some of our church traditions, these have the power to form us and direct our passions. Third, even if you assume that Jesus wanted to bomb the daylights out of these Samaritans, the disciples still wanted to have the pleasure of actually pulling the trigger (“Do you want us …”)! But, why? Why did they want to completely obliterate an innocent village of strangers who had done them no harm? Also, let’s not forget that earlier in this chapter, these same disciples were busy in the wonderful business of preaching, teaching and healing people (9:6). Now, without warning, the worst came out of them. How come preachers of the good news appear to have become destroying angels? What is wrong here? These disciples of Jesus were good, pious Jews who had left everything to follow the Messiah. But there are blind spots that good pious Jews might have. There are inherent evil attitudes that good followers of Jesus could still hold on to. Our times, the social class we belong to—and not to miss, the so-called caste we are born into—our cultural and political upbringing, and even some of our church traditions, these have the power to form us and direct our passions. The disciples’ question shows exactly how they felt towards Samaritans. I wonder why these disciples never seemed to have discussed the possibility of having a bombing mission of the Nazareth synagogue, while in session, just to teach the people there a lesson for trying to kill Jesus (see Luke 4:28–30). Of course, not! They are “our own people”. But Samaritans—they were dispensable dirt! They would have imbibed this animosity towards the Samaritans growing up in their Jewish homes, schooled by their history, culture and customs. On one hand, they were busy following Jesus, even carrying out a successful evangelistic mission at Jesus’ command. Yet, on the other, when they encounter people they customarily dislike, even hate, they forget their evangelistic mandate and put on a demonic mantle. No wonder, Jesus sharply rebuked them. In case we want to grasp the full impact of the well-known (but little understood) parable of the “Good-Samaritan” found in the next chapter in Luke’s Gospel, one needs to grapple with this preceding Samaritan episode. This intended but aborted bombing mission helps to get at the heart of Jewish-Samaritan relationship. The questions we ask, or don’t, tend to reveal the kind of issues we really care about. Who do we seek to serve? Will we only ask those questions that comfort us and those around? Are we willing to have a larger vision of God’s work and ways than what our cultures, national loyalties, even our church traditions constrain us to envision? Can we see God’s immeasurable love for all people, rather than just for the little world of friends we have constructed? Can we hear Jesus rebuking us? The irony is that later, after his resurrection, Jesus commanded his disciples not to bypass Samaria in the powerful outward spread of the Gospel empowered by the Holy Spirit (Acts 1:8). Jesus wants us to see how much he loves all—including our enemies. 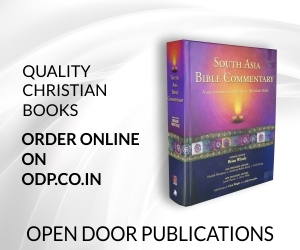 Jacob Cherian teaches New Testament at Southern Asia Bible College, Bengaluru. Thank you sir, Iam blessed to read it.